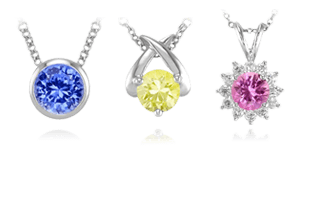 Using the oldest way of cutting crystals, cabochon sapphires exhibit a raw beauty and a truly timeless appeal in any color. 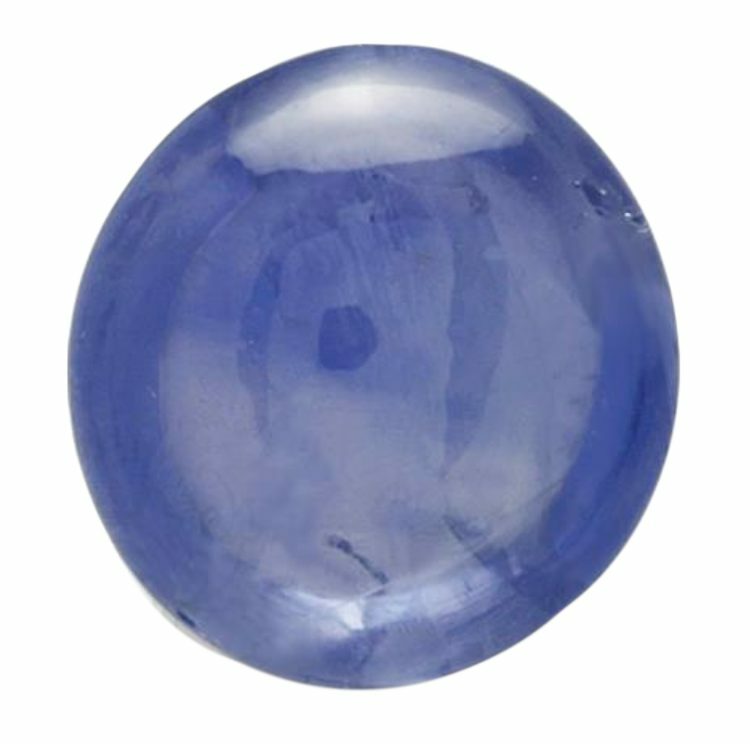 A clear blue Ceylon cabochon sapphire. A cabochon sapphire shouldn’t be thought of as just a way to cut a sapphire. Yes, it is the most ancient and historical way of cutting and polishing a stone, but this unique cut accomplishes a lot more. A cabochon cut on a sapphire shows the very distinctive raw beauty of the particular crystal. The look is very unique and not like any other type of appearance in a gemstone. For this reason we do not classify these stones by cut alone. A Cabochon is one method of cutting a sapphire, but it is also a lot more than just a way to shape a sapphire from its rough form. Sapphire crystals come from the earth in many shapes, clarities and colors. They should be cut and shaped in various ways to expose as much of the natural beauty as the stones possesses. 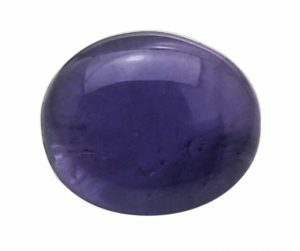 A vibrant purple cabochon sapphire, a quite rare color for cabochons. 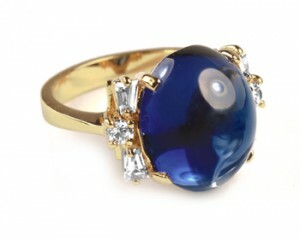 Cabochons are most often seen in blue sapphires. A true cabochon should not be confused with a star sapphire, as most star sapphires do not have the clarity and look of a clean beautiful cabochon. A star sapphire looks very much like a regular cabochon but it shows a star effect in direct light and usually has less clarity properties. A fine cabochon is for color purists. These stones do not give flashes and dances of light reflection. There is no “glitter.” It is for pure enjoyment of color. It is important that the color within the stone be evenly distributed so that no “ color zoning ” becomes too apparent. 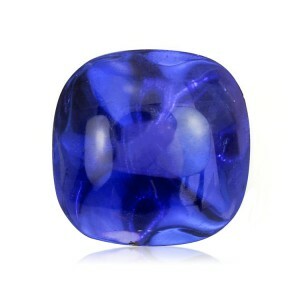 Heavily zoned or included cabochon sapphires will cost a lot less than clean transparent cabochons. A blue sapphire sugarloaf cabochon with its signature high dome. Cabochons come in many different shapes. Oval, round, and cushion shapes are the most common. One of the most desirable and rare is the “sugarloaf.” This is a high dome-shaped cabochon that has a very unique look. High-dome sugarloafs are in high demand and difficult to find. The prices can be considerably more than a standard dome height. This is one of the most conservative and popular cuts for a cabochon sapphire. 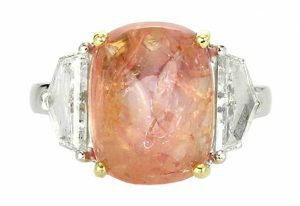 A stunning and incredibly rare padparadscha cabochon sapphire and diamond side stone ring. 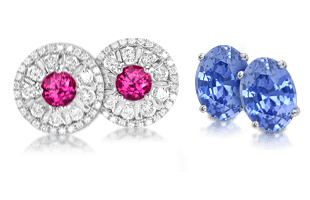 Sapphire cabochons are seen in all the colors of sapphires. 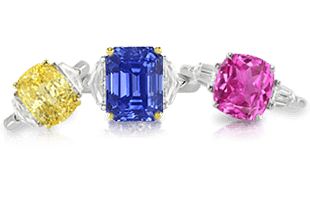 The most prevalent and in demand are blue sapphire ‘cab’ as they are sometimes called. Some yellow and pink color cabochons are seen on occasion, but the demand is generally lower and it is highly unusual to see these color sapphires in a cabochon. Rare and unique colors, such as purple, violet, or Padparadscha are almost never seen in cabochons. A clean “glassy” appearance is the most desirable look in any cabochon. This is exceptionally rare, as most very clean material is cut into traditionally faceted sapphires. Large cabochons are very difficult to find and should be highly appreciated when seen, as these are a rare look into the raw color beauty that this special cut reveals. 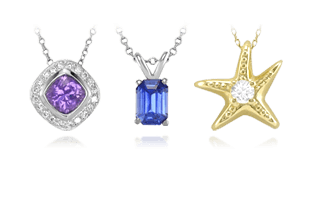 Cabochon sapphires are found everywhere that sapphires are currently mined today. Many beautiful examples of cabochon sapphires are found in the top producing regions of blue sapphires like Madagascar, Sri Lanka, Burma, Thailand, and Australia. The difficulty of finding a gem-quality cabochon sapphire is ensuring that it stays uncut and faceted into a gemstone, since those that are of high quality and exceptional clarity are usually set aside for just that treatment. Next we explore exactly the form that sapphires are found in the ground as we transition to the earthy and impressive world of Sapphire Crystals.